Spike Lee first sent major shockwaves in to the Hollywood scene with his wickedly entrancing 1989 outing, Do the Right Thing — which happens to be just as invigorating as it is riveting and thought-provoking. This only led Lee on to a career that included most notably films like Malcolm X, and 25th Hour. Both of which are considered some of his best material to date. But where Spike Lee has solidified himself as one of, if not the greatest filmmaker of our generation is the consistently ambitious commentary and social awareness he’s inscribed in to his projects. As well as the bold political relevance and poignancy that are infused to further extend parallels that reflect back to the current state of our real world. 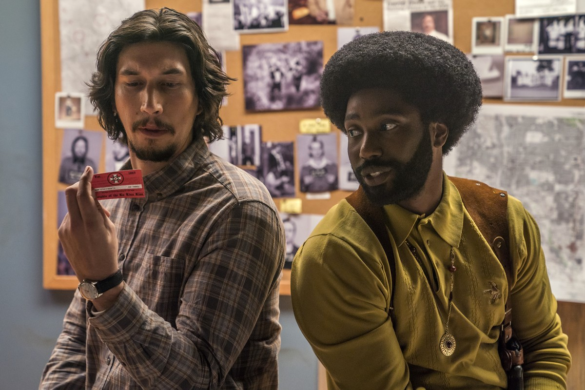 Which is exactly what BlacKkKlansman does, by exploring a traditional quest for racial equality and balance, and examining the ideology that sprouts from everyone’s personal motives. Ron Stallworth (Washington) is an eager, somewhat angsty young adult who’s just joined the Colorado Springs police force. Although he thinks to a certain degree very highly of himself, he’s dismissed by his captain and sheriff quite early in the film’s slow-burning exposition. After setting up a meeting with one of the higher-ups of the local Ku Klux Klan to infiltrate and prevent a race war he sees as inevitable, they send in Flip Zimmerman (Driver) as an undercover Klan member to expose any hostile actions they might be planning. Tensions are already heating up between local African-American empowerment groups and of course the KKK. But once Driver is sent in to the battlefield, the entire spectacle of the issue is fully revitalized and displayed impeccably. Stallworth also strikes up a bond and relationship with Patrice Dumas (Harrier), who happens to be a lead president for one of those groups thats pleading for and exhibiting the idea of black power and liberation. Between both of our main protagonists, we’re able to see what’s going on from both sides of the social spectrum, as opposed to just usually being a third-party. John David Washington, who hasn’t really been in a massive amount of projects up to this point in his career, hammers the nail on the head as our main character, Ron Stallworth. He’s an extremely talented rookie actor who portrays our stubborn and restless rookie detective. Adam Driver, our other main protagonist, is of course, just as solid as always. Yet another performance he can add to his filmography that is just as admirable as the next. What I find the most rejuvenating about this duo however, is that there’s always some kind of obstacle being hurdled at them. Whether it be Stallworth or Zimmerman. Physically or mentally, they’re constantly being beat down and challenged throughout the film, giving them hardly any time or room for error. They’re always on their feet and always have to be prepared for any last minute switch of plans. Which as you can imagine, makes it hugely investing. Even though it’s only been about roughly three years since Lee’s last full-feature length film, Chi-Raq, a project of this scale sustaining subject matter Lee absolutely dominates in is what propels this movie forward to being the quality it deserves. As Lee puts it at the beginning, this was based upon “some fo’ real, fo’ real sh*t”, which is the basis for the exceptional screenplay penned by Lee and a few others. There’s little pockets of humor sprinkled throughout the movie that can both be dark, and even kind of satirical. The few gags I’m talking about in particular take subtle shots at referencing today’s political climate, which is something alternatively hilarious I didn’t see coming. Despite this, Lee and his group of writers nearly explore the conflict between both races to its fullest extent. The supporters from each race and organization aren’t lopsided in their beliefs. It feels as though they’re both equal in terms of their passion for power through their race. Which I think is the most accomplished aspect through that observation. In a way showing that even through all of the hatred, they’re humans, just like each other. Ron Stallworth’s character development is also one of the premier things to come from this film. He’s obviously attempting to do what’s right while simultaneously bettering the lives of not just his race, but all races. But becomes tested in a situation of what’s really right. It’s all based upon perception, and through himself he needs to figure out what he has to do. Not what he needs to do, but what he has to do. Which is just an utterly brilliant character study to me. As intuitive as BlacKkKlansman eventually ends up being as a final product, it would be difficult to truly believe that early on in the film, I wasn’t completely on board with the inclusion of everything being presented. It feels as though for the first hour or so, Lee didn’t quite establish the film that he was so passionate on curating. There hardly ever feels like there was ever any zealous or stable sense of a focus or direction pertained towards the project, and you begin to question about which path the film is going to proceed down. It left me a bit unsatisfied with the first act, since I wasn’t completely able to immerse myself in the story. However, once the agenda begins to heat up with Driver being undercover, things immediately get better. Whether it be from the perfectly executed tension, or the immensely witty yet insightful interactions between each character. Something else that did quite bother me also takes place in that first hour or so too. Stallworth as a character, while quite enigmatic and well-received toward audiences, receives hardly any true background in to his own motivations behind the investigation he’s conducting. Early on he confronts a somewhat self-conflict undercover, but shelves those feelings to further focus on the case. While it’s showed that he doesn’t completely agree with both races philosophies, he doesn’t want his reluctance and personal biases to ruin the case. However, had this layer of Ron Stallworth been peeled back much more extensively from when it was first introduced to throughout the rest of the film, the already potent remainder of the movie could’ve contained such a bigger fulfilling conclusion. This can go for nearly every other character too. They wait so long to be dissected and fleshed out, that by the time you want to analyze their decision-making, it’s too late. Between both of our protagonists, their motivations aren’t unraveled full circle until nearly the halfway point of the film, as we see them stop dragging their feet and accept what they need, and what they’re going to do. This issue definitely holds the least significance out of my nitpicks, but a handful of the technical aspects attached to this film aren’t exactly up to par when compared to the standards that have been set in the industry today. The component that caught my eye the most was it’s very unpolished editing. It’s a lot easier to catch as you’re watching the film, but it’s a really unbalanced put together film. The cinematography is also another really bizarre case to me. It doesn’t tread upon being awful, but there are shots here and there that’ll cut off the top of character’s heads, or even during a non-action scene the cam is noticeably shaking. I’m not sure what the decision making was behind these aspects, but I assure you I was not the biggest fan of them. While I ultimately did have a few minor problems with BlacKkKlansman as a whole, once the halfway point of the movie kicks in, there’s no turning back. The performances are superb, as well as the remarkable screenplay. We’re fully able to get behind our protagonists personal issues and motives they have towards everyone around them as well. It’s portrayal of a time not so long ago where the abundance of loathing and potential bloodshed amongst races is both fervent and insightful. The commentary from Lee is also gripped with a damaging call to action. Let’s just say, it’s socially applicable to the real world we live in now more than you think. Hear our podcast review on Episode 286, coming soon.